Spinnin for 2012 - Accelerate Productions. Accelerate dancer Jo White features in the new music video for Dionne Bromfield, Tinchy Stryder – Spinnin For 2012. 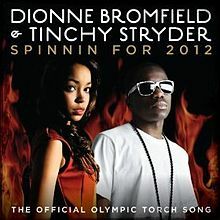 Spinnin For 2012 is the Official Olympic Torch Song for the London 2012 Olympic Games. The song appears on Bromfield’s album Good for the Soul, and is scheduled to appear on Stryder’s fourth studio album, Full Tank.